All About Sports Cards: Something Stickered This Way Comes. 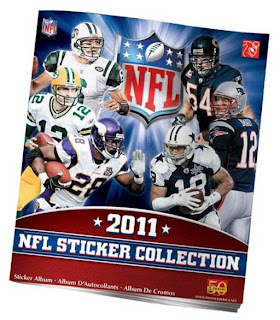 Panini releases information about the 2011 NFL Sticker Collection. Something Stickered This Way Comes. Panini releases information about the 2011 NFL Sticker Collection. The Knight's Lance has just released details on Panini's 2011 NFL Sticker and Album Collection. With a familiar configuration of $1 per seven sticker pack and $2 for the 72 Page Album, this year's collection comes in at 494 stickers, 354 glossy base stickers, 100 Holographic stickers and 40 Micro-Etched stickers. We have no idea if there will be an NFL season this year, but we will have Football here at the blog. At a rate of about 4 pages a week we will do our best to fill an album and share our progress with you. We might even give away a few home made starter kits to get some of you on your way to filling an album. For more information, check out The Knight's Lance.